2 Australia, 3 certificates, Big Blow Gold Mines Ltd., 1895, True Blue (Hannan?s) Gold Mine Ltd., 1895, and Standard Exploration Co. Ltd., 1900, vignette of lions pulling chariot with female, mostly F-AVF. (3). 4 Australia, Tasmanian Government Debentures, bond for £100, Hobart 1867, coat of arms at top, blue, stamped paid, AVF. (1). 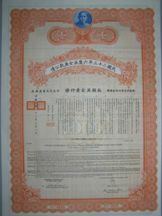 12 China, 12 bonds, United Nationalist Loan of 1936, 2 x bonds, different types, Military Loan of 1917, bond for 100 yuan, Manchukuo Savings Society Bonds, 1930-36, two types, Ministry for Railways of Canton-Hankow, 1930, bonds for 40 yuan and 100 yuan, Kwang-Tung Public Loan of 1912, two types, and Nationalist Government Lottery Loan of 1926/7, three types, mostly VF. (12). 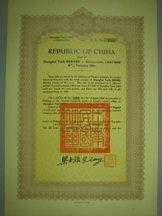 13 China, 15 bonds issued by the Lung-Tsing-U-Hai Railway, 1913 Gold Loan, 3 x bonds for £20, Loan of 1920, 1 x issued and 2 x unissued bonds for 500 francs, Loan of 1921, 2 x issued and 2 x unissued bonds for 500 francs, Loan of 1923, 1 x issued and 2 x unissued bonds for 500 francs, also Loan of 1925, 2 x bonds for 500 francs, various colours, one without coupons, mostly VF-EF. (15). 14 China, 3 bonds, Hukuang Railway 1911 Gold Loan, bond for £20, German issue, Province of Petchili 1913 Gold Loan, bond for £20, and Republique Chinoise 1925 Gold Loan, (Boxer Loan) bond for $50, lot also contains Petroles Milano, share certificate, 1920, all with coupons, all VF. (4). 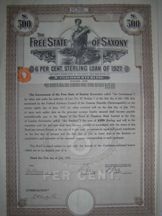 15 China, 5 bonds and certificates, Chinese Engineering and Mining Co. Ltd., issued bearer warrant for ten shares, London 1912, and unissued bearer warrant for two shares, both with vignette of allegorical figure holding shield and lamp, standing over miner with pick, orange and brown respectively, Skoda Loan of 1925, bond for £10, Boxer Loan of 1925, bond for $50, and Emprunt Chinois 5% Or 1903, bond for 500 francs dated 1905, all with coupons, mostly VF. (5). 16 China, 6 bonds, Canton-Kowloon Railway, bond for £100, London 1907, Tientsin-Pukow Railway, bond for £100, London 1908, Chinese Government 1912 Gold Loan, bond for £20, and Lung-Tsing-U-Hai Railway 1913 Loan, 2 x bonds for £20, and 1921 issue, bond for 500 francs, all with coupons, mostly F-AVF. (6). 17 China, 6 bonds, Government of the Province of Petchili 1913 Gold Loan, bond for £ 20, Railway Equipment Loan of 1922, 3 x bonds for £20, and Emprunt Industriel du Gouvernment de la Republique Chinoise 1914 Gold Loan, 2 x bonds for 500 francs, all with vignettes, all with coupons, all VF. (6). 18 China, 7 bonds, Emprunt Chinois 5% Or 1903, 2 x bonds for 500 francs dated 1905 and bond for 500 francs dated 1907, Tientsin-Pukow Railway Loan, bond for £100 dated London 1908, and bond for £100 dated Berlin 1908, Tientsin-Pukow Railway 1910 Supplementary Loan, bonds for £20 and £100, German issue, all with coupons, lot also includes £12 scrip certificate dated 1938, F-VF. (8). 20 China, Chinese Government 1912 Gold Loan, 2 x bonds for £20, and 1 x bond for £100, ornate design, black & blue and black & green respectively, with coupons, mostly VF. (3). 21 China, Chinese Government 1912 Gold Loan, bond No.191 for £500, ornate design, black & brown, with coupons, AVF. (1). 22 China, Chinese Government 1912 Gold Loan, bond No.346 for £1,000, ornate design, black & red, with coupons, AVF. (1). 23 China, Chinese Government 1913 Reorganisation Gold Loan, 2 x bonds for £20, and bond for 189.40 roubles, all with vignette of Mercury and Chinese scenes, brown and green respectively, also Boxer Loan of 1925, bond for $50, all with coupons, all VF. (4). 24 China, Chinese Government 1913 Reorganisation Gold Loan, 2 x bonds for 505 francs and 1 x bond for £20, vignettes of Mercury and Chinese scenes, black & brown, with coupons, lot also includes ‘traunche Russe? receipt for coupons dated Paris 1922, F-VF. (4). 25 China, Chinese Government 1913 Reorganisation Gold Loan, 3 x bonds for 189.40 roubles, one with Nanking overprint and one with blue ‘original security? stamp, all with vignettes of Mercury and Chinese scenes, black & green, with coupons, all VF. (3). 26 China, Chinese Government 1913 Reorganisation Gold Loan, 4 x bonds, different denominations, 409 marks, 505 francs, £20 and 189.40 roubles, Belgian issue, all with vignettes of Mercury and Chinese scenes, black & brown, with coupons, all VF. (4). 28 China, Chinese Government 1913 Reorganisation Gold Loan, bond for £20, vignette of Mercury and Chinese scenes, black & brown, with coupons, VF. (1). 30 China, Chinese Government 23rd Year (1934) 6% Sterling Indemnity Loan, bond No.6693 for £1,000, vignette of Sun Yat Sen at top, black, red & blue, with coupons, AEF. (1). 32 China, Chinese Government Shanghai-Hanchow Ningpo Railway Completion Loan of 1936, bonds for £50 and £100, both large format with vignette of Sun Yat Sen at top right, various colours, with coupons, VF. (2). 33 China, Chinese Government Treasury Notes, 1919 Vickers Loan, 4 x bonds for £100, all with vignette of river scene, black & green, all with coupons, mostly VF. (4). 37 China, Chinese Government Treasury Notes, dated 1919, (Vickers Loan), bond No.10248 for £1,000, vignette of river scene, black & brown, with coupons, VF. (1). 40 China, Chinese Imperial Government 1898 Gold Loan, bond for £25, Hongkong and Shanghai Bank issue, red, large format, with coupons, scarce issue, this bond is in poor condition with large tear and repairs, Poor. (1). 42 China, Chinese Imperial Government 1898 Gold Loan, bonds for £50 and £100, Hongkong and Shanghai Bank issue, orange and brown respectively, large format, both with coupons, the £50 bond is a scarce issue, minor edge damage to both, does not effect print, AVF. (2). 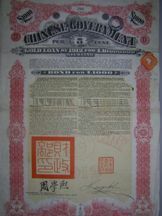 43 China, Chinese Imperial Government Gold Loan of 1898, unissued bond for £25, also known as reserve stock of which only 45 are reported to exist, Deutsch-Asiatische Bank issue, ornate border, large format, red, with full coupons, AEF. (1). 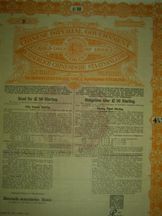 44 China, Chinese Imperial Government Gold Loan of 1898, unissued bond for £50, also known as reserve stock of which only 45 are reported to exist, Deutsch-Asiatische Bank issue, ornate border, large format, orange, with full coupons, AEF. (1). 45 China, Chinese Imperial Government, Honan Railway 1905 Gold Loan, 3 x bonds for £100, all London 1905, ornate border, black & green, all with coupons, F-VF. (3). 46 China, Chinese Imperial Government, Honan Railway 1905 Gold Loan, bond for £100, London 1906, ornate border, black & green, with coupons, AVF. (1). 47 China, Chinese Imperial Railway Gold Loan, Imperial Railways of North China, 2 x bonds for £100, both London 1899, large format, brown on pale blue, with coupons, minor edge damage, otherwise, AVF. (2). 48 China, Chinese Imperial Railway Gold Loan, Shanghai-Nanking Railway, 3 x bonds for £100 dated London 1904, and bond for £100 dated London 1907, large format, black & red, all with coupons, lot also includes 4 x net profit sub-certificates, F-AVF. (8). 49 China, Chinese Imperial Railway, Canton-Kowloon Railway, 4 x bonds for £100, all London 1907, ornate border, large format, black & red, all with coupons, mostly VF. (4). 50 China, Chinese Imperial Railway, Canton-Kowloon Railway, bond for £100, London 1907, ornate border, large format, black & red, with coupons, VF. (1). 51 China, Compagnie Générale de Chemins de Fer et de Tramways en Chine, 25 x share certificates, all with vignettes of bridge and rural scenes, black & brown, all with coupons, single cancellation hole through each signature, VF-EF. (25). 52 China, Compagnie Générale de Chemins de Fer et de Tramways en Chine, 25 x share certificates, all with vignettes of bridge and rural scenes, black & brown, all with coupons, single cancellation hole through each signature, VF-EF. (25). 57 China, Imperial Chinese Government 1908 Gold Loan, 5 x bonds for £20, all Banque de l?Indo-Chine issue, all with vignette of walled city, black & green, right and bottom margins uneven where coupons cut for payment, no coupons remain, F-AVF. (5). 58 China, Imperial Chinese Government 1908 Gold Loan, bond for £20, French issue, and bond for £100, British issue, both with vignette of walled city, green and mauve respectively, right and bottom margins uneven where coupons cut for payment, no coupons remain, both AVF. (2). 59 China, Imperial Chinese Government Hukuang Railways 1911 Gold Loan, 2 x bonds for £20, French issue, 2 x bonds for £20, German issue, 1 x bond for £100, French issue, 2 x bonds for £100, German issue, 1 x bond for £100 British issue, and 1 x bond for £100, American Banks issue, all with vignette of train, black & green and black & red respectively, all with coupons, mostly F-AVF. (9). 62 China, Lung-Tsing-U-Hai Railway Dutch issues, bond for 1,000 florins, 1920 and bond for 1,000 florins 1923, both with vignette of bridge at top, also 2 x bondholders certificates of 1928, all with coupons, all VF. (4). 63 China, Republic of China 6% Treasury Bills of 1912, bond for 1,000 Shanghai taels or 2,745 marks, issued by Deutsch-Asiatische Bank, Lit B, No.108, ornate border, black & brown on yellow, one coupon remains, AEF. (1). Only 75 bonds designated Lit B were issued. Kuhlmann reference 269B. 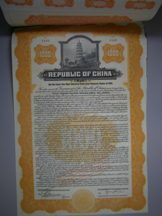 64 China, Republic of China Two Year 1919 Gold Loan Treasury Notes, bond No.4440 for $1,000, attractive vignette of pagoda, black & yellow, with coupons and scrip certificate, VF. (1). 65 China, Republic of China, 1937 Secured Sinking Fund, bond No.M4054 for $1,000, attractive vignette of pagoda, black & blue, with coupons, VF. (1). 66 China, Shanghai Power Company, registered debenture, 1934, vignette of waterfront scene which has been overprinted with an endorsement, black & orange, lot also include a 1925 ‘Boxer? bond for $50 gold, both VF. (2). 67 China, The 36th Year (1947) Short Term Treasury Note of the Republic of China, first issue, bond for $10, vignette of Chiang-Kai-Shek at top right and lorry at bottom right, text in Chinese with English on reverse, red, small format, no coupons remain, also Canton Citizen-Self-Governing Lottery Loan, bond for 1 yuan, central vignette of building, small format, red & blue, both VF. (2). 75 France, Societe Fermiere des Casinos de Nice, 5 x parts bénéficiaires, Nice 1910, very attractive design incorporates flowers, coat of arms and mask, large format, dark green on yellow, with coupons, mostly AVF. (5). 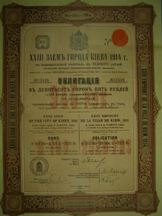 76 France, Sucrerie-Distillerie & Exploitation Agricole de la Nouvelle-France, certificate for 100 franc share, circa. 1880s, very ornate border incorporating harbour scene, trees, distillery and men shaking hands, black on green, with coupons, VF. (1). 78 Germany, Free State of Saxony 1927 Sterling Loan, bonds for £20, £100 and £500, all with large vignette of allegorical female holding sheaf of wheat, orange, blue and brown respectively, with coupons, only 350 bonds of the £500 denomination were issued, thus scarce, VF. (3). 80 Great Britain, 24 certificates, dated 1920-1929, titles include, Deanscales Mining Co. Ltd., 1923, South Leicestershire Colliery Co. Ltd., 1926, United States Debenture Corporation Ltd., 1925, Palmers Shipbuilding and Iron Co. Ltd., 1927, West Springs Ltd., 1924, Northumberland Shipbuilding Co. Ltd., 3 x certificates, all 1920, Blue Bird Petrol (Foreign) Ltd., 1929, minor duplication, mostly VF. (24). 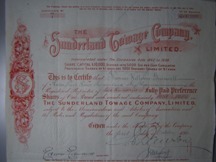 81 Great Britain, 8 Victorian share certificates, Twenty Well Stone & Brick Co. Ltd., 1871, Oriental Inland Steam Co. Ltd., 1860, Coal Consumer?s Association Ltd., 1873, Rochdale Property & General Finance Co. Ltd., 1865, Norfolk Estuary Co., 1847, Wylie & Lochhead Ltd., 1883, Wigan Public Hall, 1853, and Shand and Co. Ltd., 1878, all VF or better. (8). 82 Great Britain, A.B.C. Motors (1920) Ltd., certificate for preference shares, 1920, this company originally made motor cycles and engines, in 1920 it completed its first motor car, factory was situated in Surrey, ornate border, blue, AVF. (1). 84 Great Britain, Channel Tubular Railway Preliminary Co. Ltd., certificate No.86,336-340 for five shares, London 1892, very attractive design incorporating train in tube under the channel and scenes of the English and French coasts, text in English and French, black & yellow, minor creasing to margins, does not effect print, otherwise VF.(1). 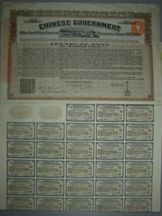 85 Great Britain, Charles Laffitte & Co. Ltd., 30 x share certificates, all 1866, ornate heading, black, mostly VF-EF. (30). 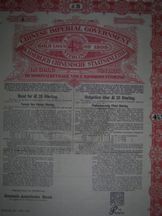 86 Great Britain, Consett Spanish Ore Co. Ltd., 3 x certificates for one share, all 1873, ornate heading, black, all AEF. (3). 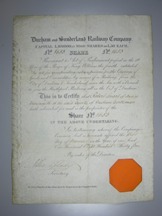 87 Great Britain, Durham and Sunderland Railway Co., certificate No.1653 for one share, dated 1834, printed on vellum, black, red seal, scarce, F. (1). 92 Great Britain, International Pneumatic Tyre Co. Ltd., share certificate, 1894, vignette of factory at left, dull blue, lot also contains Persil Flexible Wheel Tyre Syndicate Ltd., share certificate, 1893, vignette of wheel at top, brown, AVF. (2). 97 Great Britain, Peninsular Co. Ltd., 2 x preference share certificates, 3 x ordinary share certificates, and 3 x deferred share certificates, 1864-67, different design for each class of share, black, mostly VF. (8). 99 Great Britain, States of the Island of Jersey, issued £5 interest bearing note together with an unissued note, both 1840, Jersey coat of arms at top, the issued note has ink cancellations through signatures, both VF. (2). 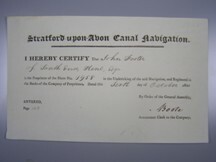 101 Great Britain, Stratford-upon-Avon Canal Navigation, certificate for share No.1958, dated 1823 over 181-, small format, black, very clean condition, scarce, AEF. (1). 110 Italy, Genoa and District Water Works Co. Ltd., £20 debenture, 1913, very attractive vignette of Genoa harbour with many ships, text in English and Italian, black & red, with coupons, VF. (1). 123 Russia, 5 City scrip certificates, St. Petersburg 1913 Loan, scrip certificates for £20 and £100, Kieff 1914 Loan, scrip certificates for £20 and £100, and Perm 1914 Loan, scrip certificate for £100, mostly VF. (5). 131 Russia, Banque Fonciere de la Noblesse a Tiflis, bond for 100 roubles, dated 1903, bond for 500 roubles, dated 1901, and bond for 1,000 roubles dated 1902, also Charkower Agrar-Bank, 2 x bonds for 100 roubles, dated 1898 and 1900, bond for 500 roubles, dated 1898, and 2 x bonds for 1,000 roubles, dated 1897 and1909, various colours, one bond without coupons, mostly VF. (8). 133 Russia, City of Baku 1910 Loan, bonds for £20, £100 and £500, all with coat of arms at top, various colours, all with coupons, the £500 bond is damaged with piece missing from right margin and edge splits, Fair-AVF. (3). 137 Russia, City of Moscow, 5 bonds, 1908 Loan, bonds for £20, £100 and 500 francs, 1909 Loan, bond for 500 francs, and 1910 Loan, bond for 1,000 roubles, all ornate with coat of arms at top, various colours, all with coupons, mostly F-VF. (5). 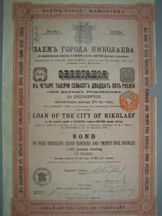 140 Russia, City of Nikolaef 1912 Loan, second series, bond for £500, coat of arms at top, red with coupons, only 14 bonds of this denomination were issued, small piece is missing from right margin and small hole in embossed revenue stamp, otherwise AVF. (1). 166 U.S.A., American Express Co., capital 7,500 shares, unissued certificate, 185-, vignette of train, black, minor discolouration to paper, otherwise VF. (1). 167 U.S.A., Anglo-Californian Gold Mining Co., 4 x certificates for one share, all 1852, ornate heading, black, VF. (4). 170 U.S.A., Camp Floyd Silver Mining Co. Ltd., certificates for one share and five shares, both 1871, ornate design, black on pale olive, embossed seal, lot also contains two transfer certificates dated 1873, all VF. (4). 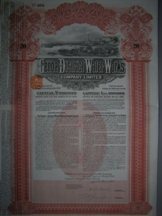 174 U.S.A., Le Nouveau Monde Company for Working Gold Mines, certificate for five shares, 1851, signed by John Taylor, text in English and French, AVF. (1).